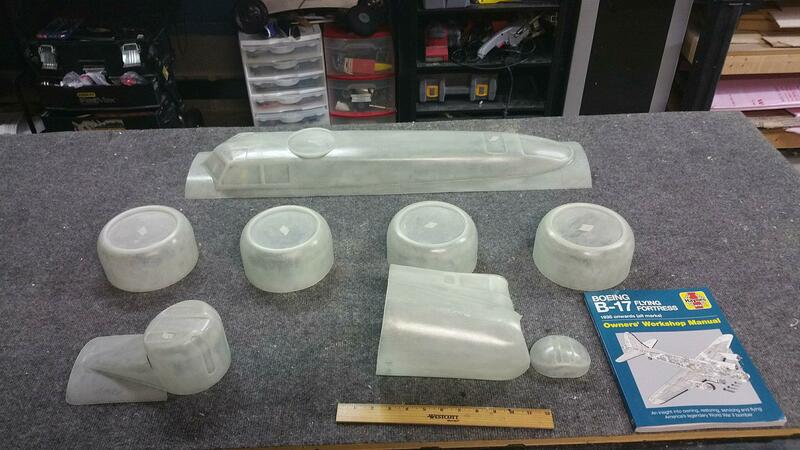 So I'm starting to plan out the fuselage and pull together the necessary parts. With the horizontal stab and elevators I made the decision to make them removable and put the servos in the stabs. This will make transport and assembly much easier, but also adds to the weight in the tail. Even with 4 motors up front I still need to be very careful with tail weight on a bomber like this. 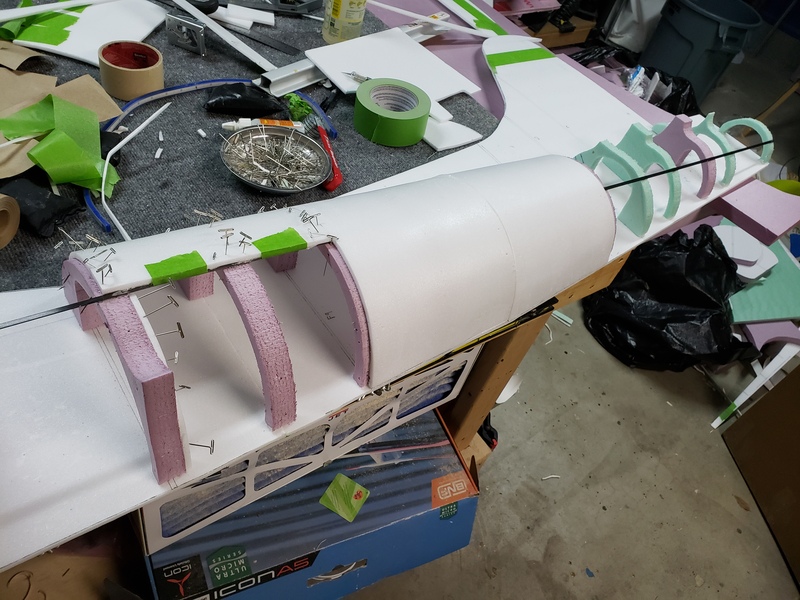 To keep weight down in the tail the vertical stab and rudder will be permanently mounted, the only plywood I'm planning in the tail will be for the tailwheel mount, and the servos for the rudder and tailwheel will be mounted as far forward in the fuse as possible with pull/pull cables. I have Kevlar thread that should work well for the rudder and steering but that is TBD. I settled on a retract unit for the tail yesterday and got it ordered. It is a solid Robart unit similar to their pneumatic or electric units, but this one is mechanical and is driven by a standard servo. Like the main gear, I really want to be able to service this myself and a servo driven unit is ideal for that. Plus if I do the linkage right I will be able to install the servo for the retract forward in the fuselage and further reduce tail weight. disadvantage is steering and rudder must be programmed together and I need to get all 4 pull/pull linkages to one servo horn. Servo placement must also work for both rudder and steering. Disadvantage is that if I find that I don't have enough authority on the ground it will be a PITA to retrofit with steering linkages. I'd go with the third, it seems like the best all around option and it's the lightest and if you happen to have lousy ground handling, you can always have a way to increase the differential thrust just for taxing. I'd say go with the 3rd option as well. With differential thrust (perhaps on a high/low or on/off switch) this thing should be able to turn in place! My opinion is only valid for handling/operations. The only benefit to be derived from the steerable tailwheel is smooth "effortless" taxiing. Once you begin your takeoff run, you will be flying and the tail should lift off fairly quickly. Without the tailwheel, you will probably need to horse it around a little, but the weight of this plane should make the taxiing reasonably smooth. I think that with very little practice you'll be able to taxi like a champ. Ok, I'm gonna say to go with option 1. 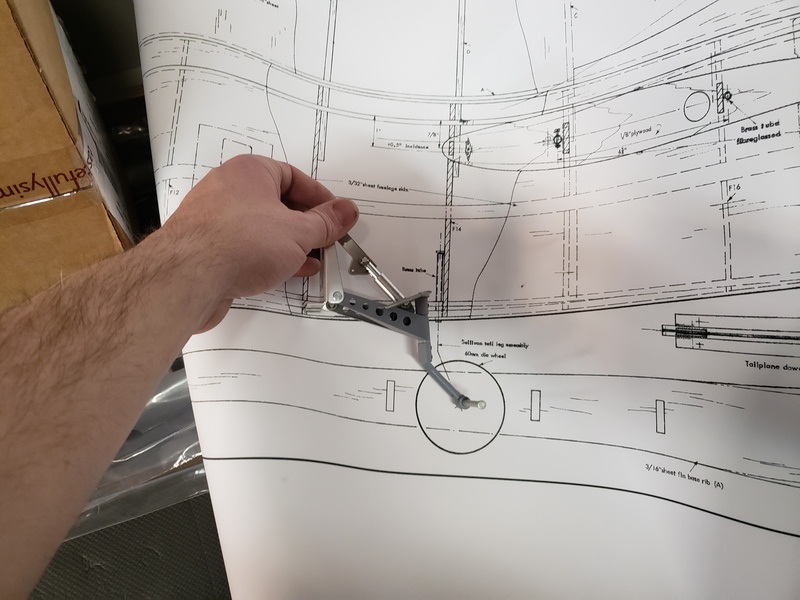 Using pull-pull kevlar lines for the steering tail will be a lighter solution than making hard linkages to tie into it from the rudder servo. You still want the rudder servo to be far aft to keep the linkage short, and therefore precise and reliable. 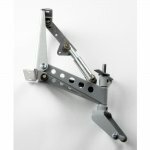 The tail gear steering servo can go much further forward and sections of guide tubes can be used into embedded foam parts. You do not need a lot of tension on this run as kevlar will not stretch or contract with heat fluctuation and is rigid enough for keeping the tail center for ground handling. I understand your desire to save weight but that does not necessarily mean you have to sacrifice functionality. You can even use carbon rods instead of steel or aluminum to control your surfaces. Placing the steering servo wherever you want... even if just aft of the bomb bay area, would still allow you to have a minimal impact on your CG. Having done pull-pull on the Corsair (among other builds), I'm a big advocate for this. I ended up being nose-heavy on that project even with all the details and such I did in the tail. Not to mention the cockpit, which is aft of the CG. The two full-size servos for the sliding canopy are aft of the entire cockpit. The 2nd option's cons can be mitigated by following the suggestions above for option #1. The 3rd option is appealing but I would do so with some extensive programming. I would program the throttle differential on a 3-position switch. One position for taxiing, middle for takeoff and landing (less), and flight (least or off). The problem is... how much is too much for take-off and landing?! Those are risky times and too little could get you in trouble on takeoff (let's not repeat the P-40-fence incident please). Too much could make you over or under compensate. You would have to set it LOW and wait for a super dead calm day to fly for the first time. I say all this with insight into your motor size and prop. It's roughly the same as the Corsair's (a 13-pounder) which is a little over 1/4 the weight of your projected weight and cruises at 75mph WOT. It's also similar to the setup in your H9 P-47... which REALLY hauls the mail. These are tremendously powerful setups that move a LOT of air and throttle differential could be a real hazard. Learning a lesson from Mac's B-29 crash... ONE motor was stuck at 1/4 throttle with the others at full and it was a disaster that ended an era of entertainment. A model this big will likely have different sensitivities to throttle differential at different speeds... that is a lot of difference! I'd also advocate for option 1. 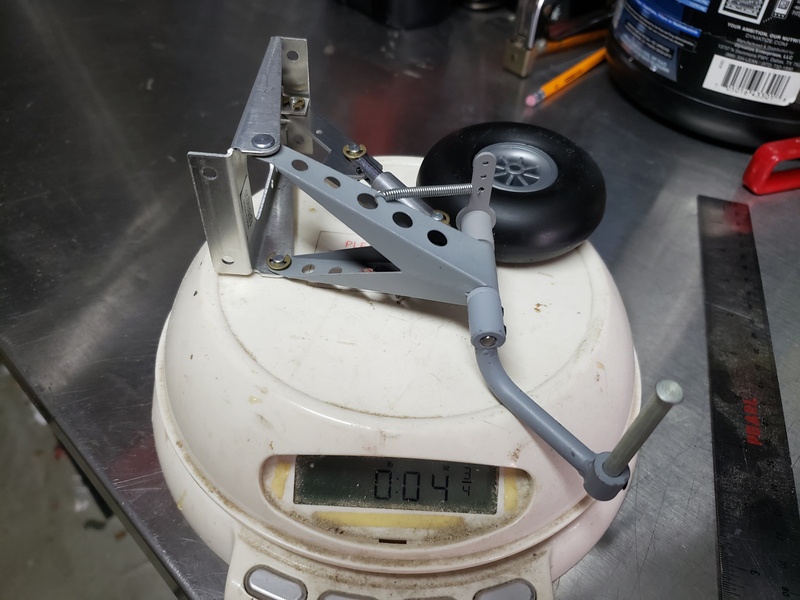 As Joshua points out, there are plenty of ways to minimize weight, even with an added servo, but the added control and safety factor is worth it. The only relevant experience I can speak from is when I put differential thrust on my Legacy. 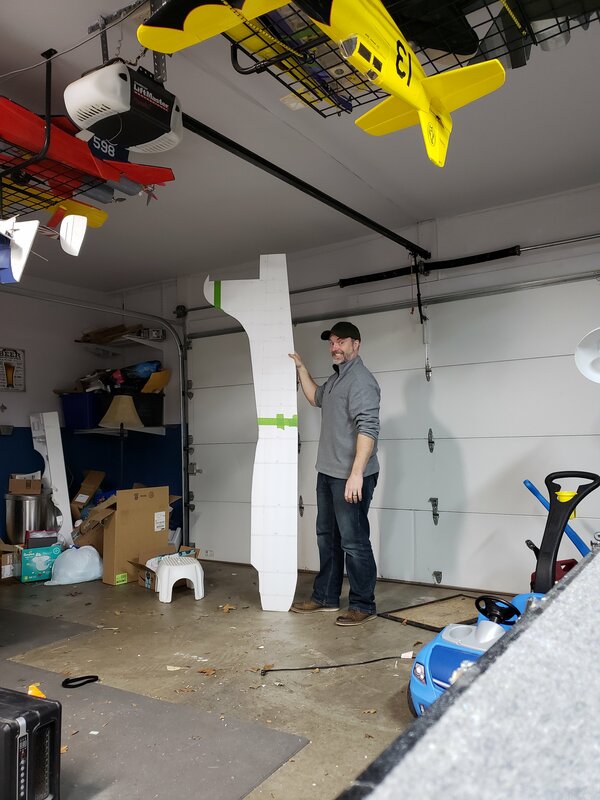 I know others have done this, but my build had oversized GT2820 motors and giant 12x6 props (well, giant for that plane). All that rotational inertia made the differential inputs massively unresponsive, to the point where I don't even both with the function anymore. 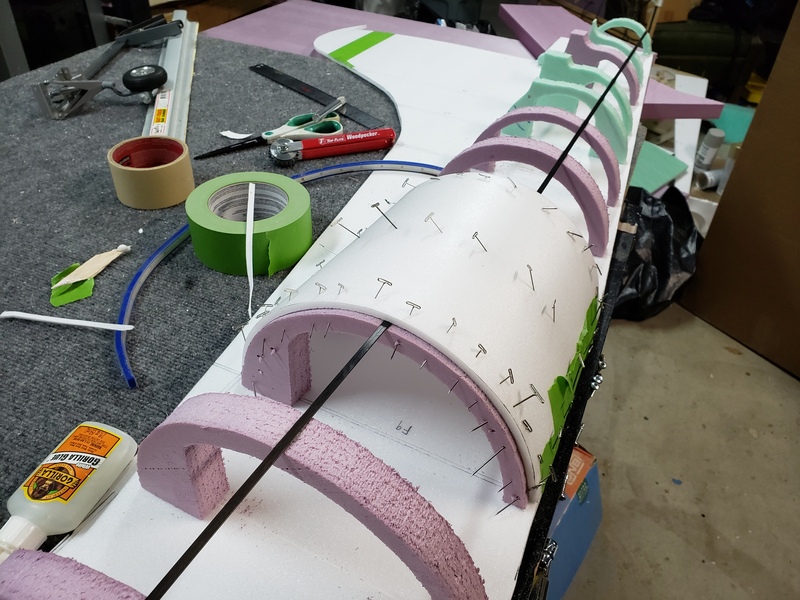 I've resorted to making my rudder bigger (adding foam to the trailing edge), and I will be adding an actual tailwheel to the rudder, instead of the standard fixed skid on the fuselage. For the size and scope of your plane, and to ensure you have the best chance at keeping it in one piece; Option 1. Then your job representing the males if the species is done. Its perfection when you can aquire approval to do something, praise and support for having done it, and not get murdered or divorced for reptative presentation of your achievement! Randomly insert Tim the Toolman gorilla sounds within the perimeter of this post at your lesiure. Thanks for all the input guys. I'll be mulling it all over during the holidays and hopefully have a finalized plan next week. Jeez! What is the length on that stab? Looks like that thing is bigger than the largest plane I own! So... fuselage planning is well underway. Actual construction won't start for a few more days while I get the last plans finalized for installation of lighting. The plan is for landing and navigation lights to be functional, and formation lights will be present but non-functional. 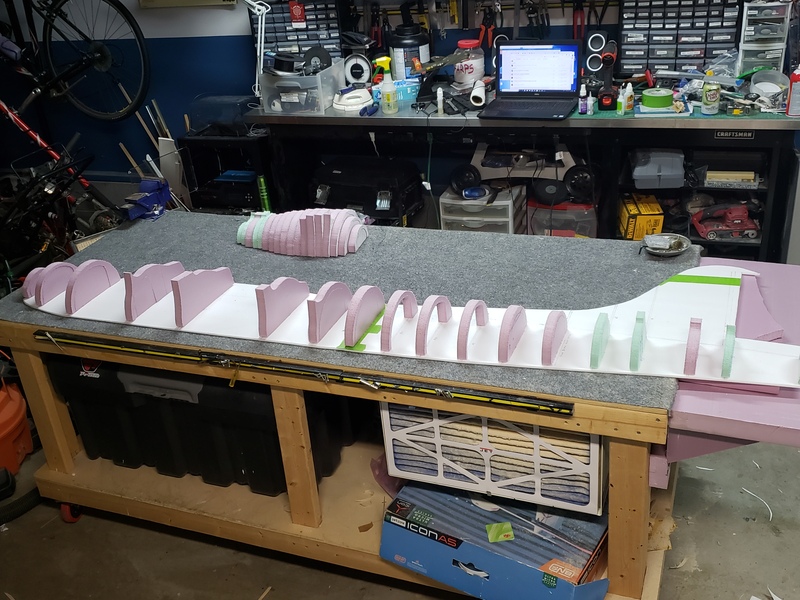 The formation lights will be VERY small at this scale, I'd want to be able to turn them on/off, and to be honest if I was going to make them work I should have already installed them in the horizontal stabilizer. A small vacuum formed blister of colored plastic with a reflective insert should look just right. I want to be 100% sure of placement so I can pre-run wiring while building the fuse. Also on the topic of fuselage construction. The tailwheel retract showed up and I'm very happy with it. The unit weighs exactly 3 ounces and is sturdy. The wheel I have for it weighs in at just under 2 ounces, so I may look for a lighter wheel. After mulling over Joshua and Ben's thoughts on the layout I'm going to keep things reliable and easily serviceable. The rudder will have its own servo installed in the vertical stab, the tailwheel will get its own steering servo with pull/pull kevlar lines from a servo far forward in the fuse, and the tailwheel will be be retracted via a second servo, also far forward in the fuse, and connected with a thin but well supported CF shaft. 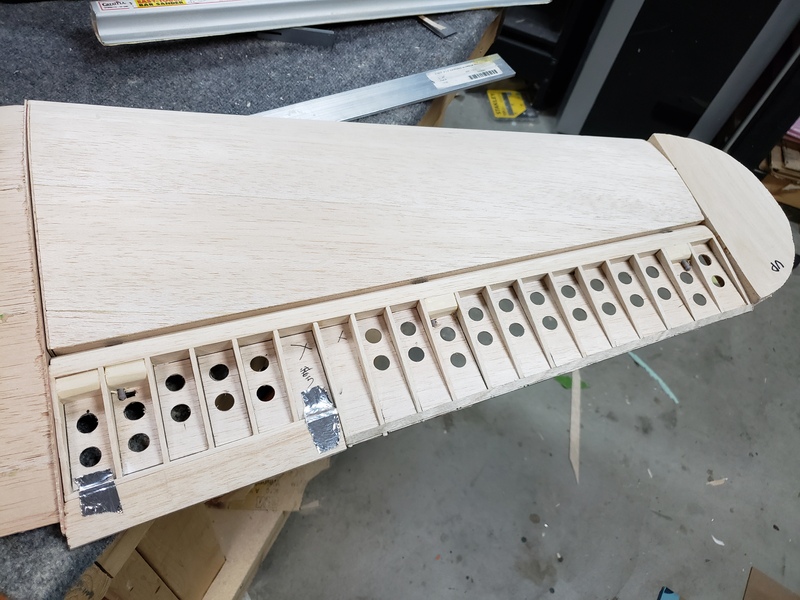 Plan is for the only plywood aft fuselage to be the one former where the retract mounts up. With the fuselage I'm also going to be "cheating" a bit. 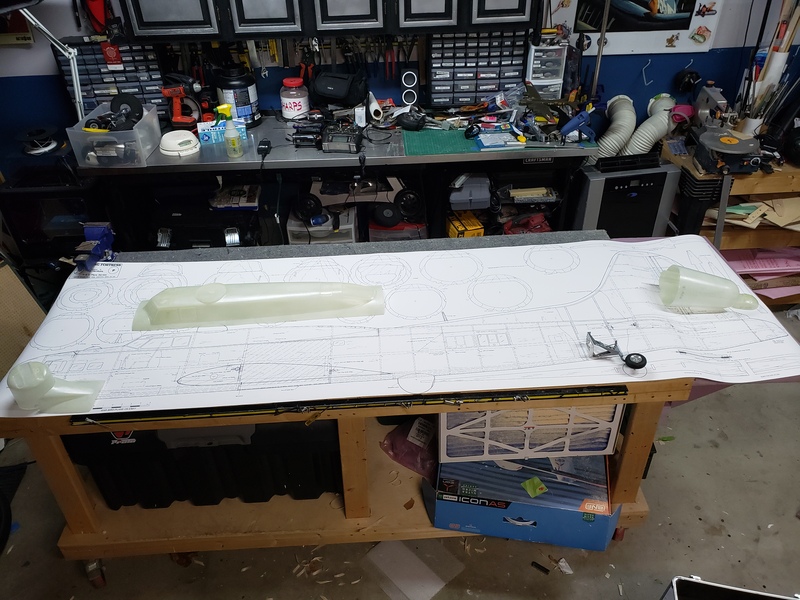 One of the reasons I settled on this exact scale was that there are some nice fiberglass parts available from wingspan models that will save me a LOT of time. Pictured below are the parts I picked up from them. There is the cockpit/upper fuse and turtledeck, the cowlings, the chin fairing and turret, the Cheyenne tail section. The parts are really well made and will save me a TON of time trying to get things just right. Still TBD is hatch access and battery placement, but we'll figure that out soon. The fuse will take quite a while to finish, but I think folks will be surprised with how quickly the process starts off. Again I'll be "borrowing" John Morgan techniques. NICE! BTW: Using molded parts for highly-detailed and complex parts of the build...totally NOT cheating! (to me) I call that "Good Resource Management". Getting a start on the fuselage construction. The method I'm using is a bit similar to building an old Guillows kit. You add half formers to a central profile. 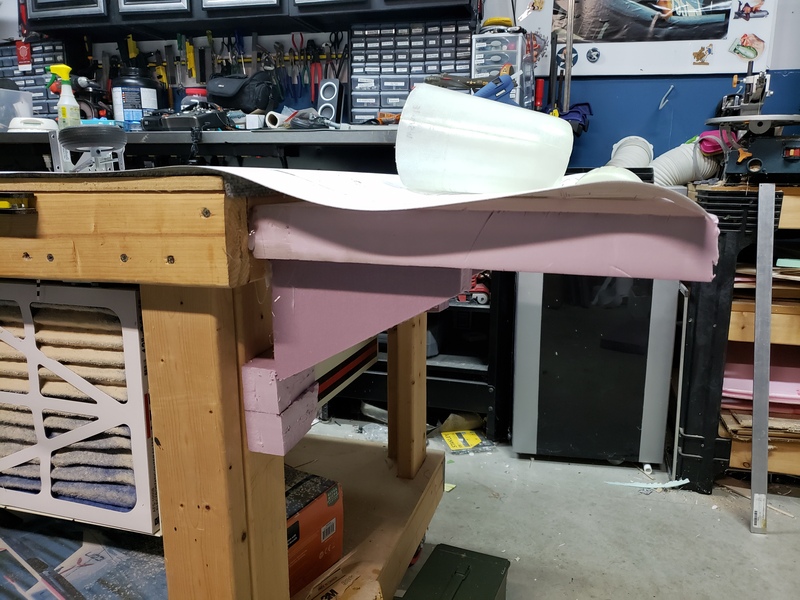 Instead of stringers you just go ahead and sheet with 6mm foam, then sheet with balsa, then fiberglass. 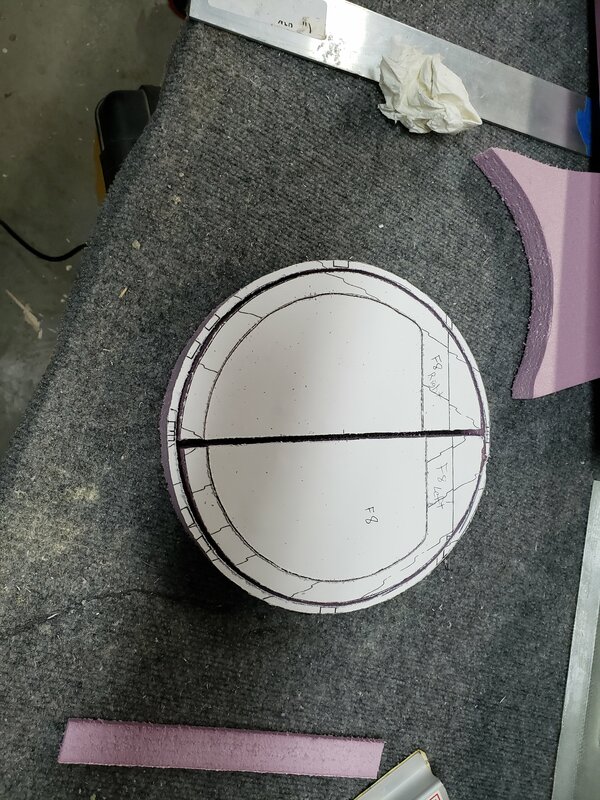 You can do this for pretty much any design that you can find a decent 3 view with formers, although in this case it helps that the formers I'm using as a starting point were already designed for an RC plane. You DO have to modify the formers though or the shape will be off. You need to remove the thickness of your sheeting material, as well as the thickness of your profile foam from the center of the former. Since the plans I'm using already accounted for 1/16th balsa skin, all I have to remove is 6mm for the foam sheeting. 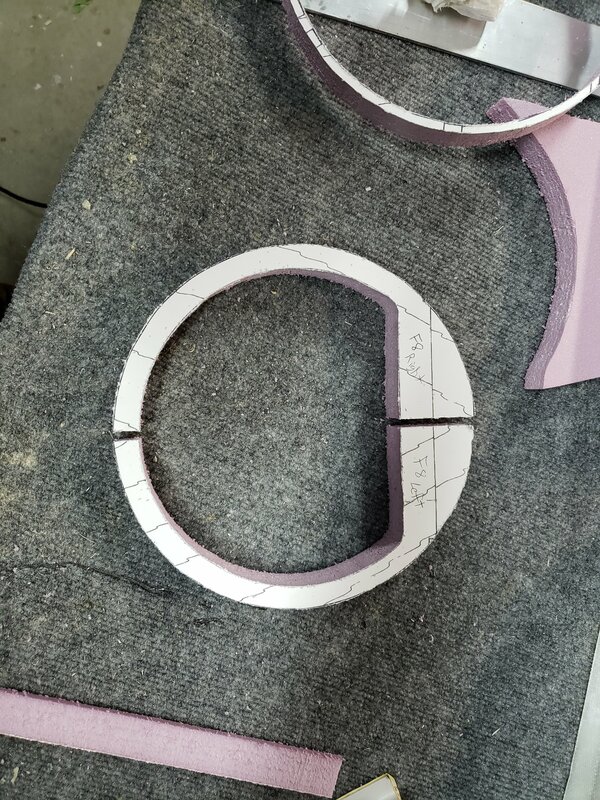 The quick and dirty way to do this is to cut the former to the lines and then drag a small custom tool across the edge to mark 6mm in. 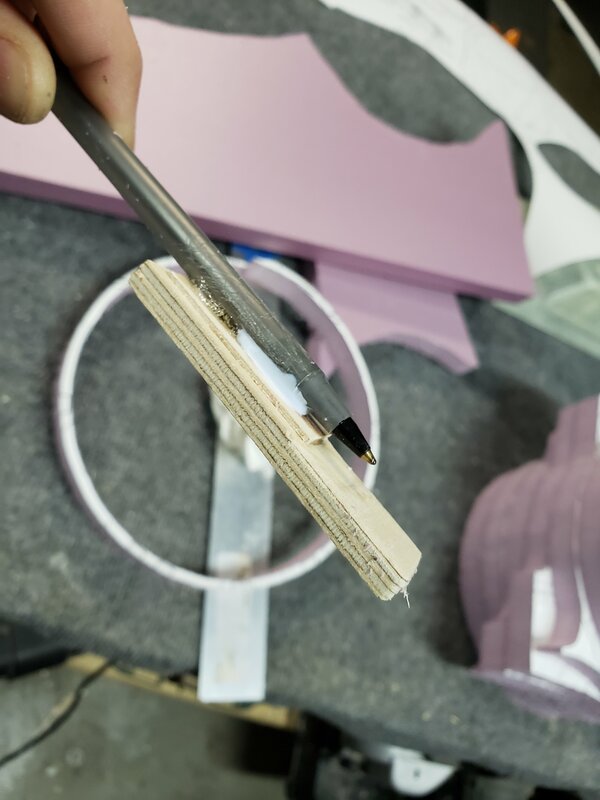 I glued a pen to a piece of ply and adjusted the spacing until it was exactly 6mm. Compound corners may need to be fudged a bit by eye, but with all the sheeting, filling, and sanding it will work out in the end. 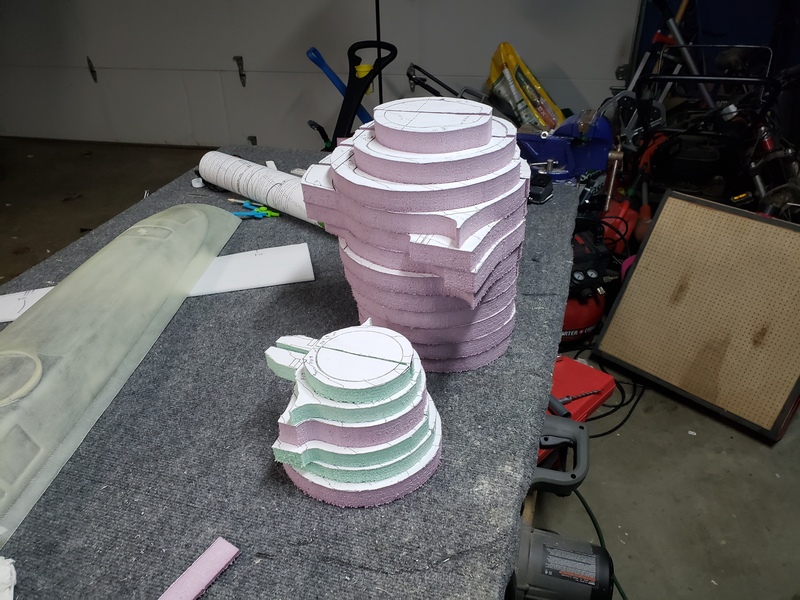 I'm also cutting away a lot of the internal material but will leave the cutouts in place during the initial gluing to make sure nothing warps or twists. Pictured are the central crutch (minus the nose and tail cone), the marking tool, and a pile of the first 8 formers cut. I need to do 18 for this section of the fuse but fortunately the tough ones are done. They get smaller and simpler in the back. Scroll saw to cut these? Buckled down this evening and cut all of the remaining formers, 18 in total. Not pictured is the enormous pile of scrap foam . I temporarily pinned them in place but I'm not going to glue them tonight. Want to look at it again with fresh eyes and make sure everything looks 100% before gluing anything. 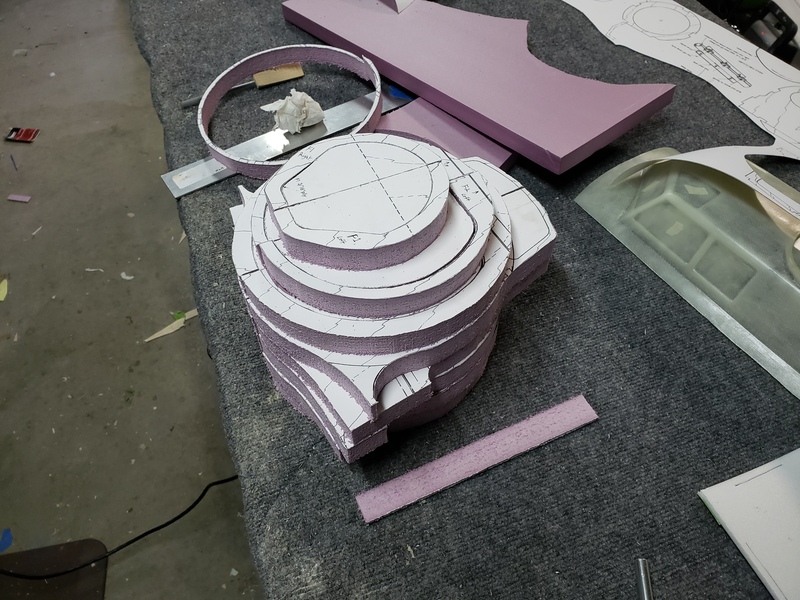 All but 2 of the formers have large open spaces already cut, but the cutouts will be left in place when I glue to ensure nothing shifts or twists. I may get the first side glued down tomorrow but we'll have to see how busy things get. Tomorrow will be another late night, but not because of anything airplane related. Looking good man! I would advise you to add some weights to the side former to help keep it flat. I've had my side profiles skew a little before if the surface is not fully flat. The glueing and taping can make things warp a little and at this size, it may be enough to be a pain to correct. Simple sammich bags with sand would be fine.